NICOLE RICHIE NEWS: Nicole Richie's latest installment of Twitter top 10! 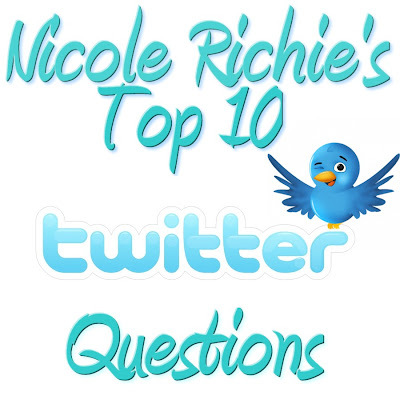 Nicole Richie's latest installment of Twitter top 10! Nicole Richie has answered some more fan questions on Twitter. @nicolerichie Favourite TV show? @nicolerichie Do u have a nanny when ur sick?? I'm jealous. I have two kids under 2 and NO NANNY!! @nicolerichie although I'm not pregnant I really liked your clothes. Are you going to be doing any for non pregnant girls? @Nicolerichie what are your favourite baby toys/products? Melissa & Doug and haba wooden toys. @nicolerichie do you love it? @nicolerichie Are you a Lady GaGa fan?? yes I think she is one of the most talented artists out there. Her piano playing is genius. @nicolerichie favourite thing to bake for harlow? I dont know how to bake. @nicolerichie what's ur favourite hair color on yourself? dark brown. But it gets depressing after a while because I wear a lot of black. @nicolerichie What do you fear the most? @nicolerichie Favourite scenic drive in Cali?